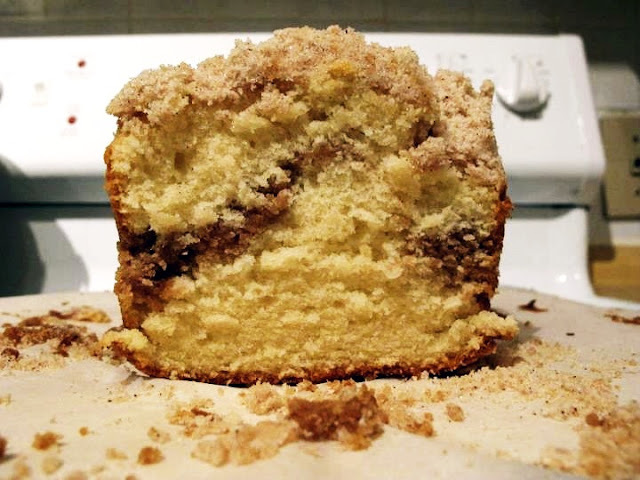 I have combined two recipes, since I want the swirl in buttermilk cake, but I also want some cinnamon streusels on the top. Cinnamon Lovers Attention!! You gonna love this! 1. Preheat oven to 325F. Line the loaf pan with baking paper. 2. In a small bowl, whisk together the dry ingredients of the Cinnamon swirl. Add the melted butter and stir until blended and crumbly. (Add more butter if needed) Do the same for the cinnamon toppings mixture in a separate bowl. 3. Sift together the flours, baking powder, baking soda, salt and into a medium bowl. Whisk to combine and set aside. 5. At medium speed, add in eggs one at a time and mix to incorporate eggs well. 6. Add in the flour in 3 portions, alternating it with milk. Mix until just combined. 7. Scrape half of the batter into the prepared pan and smooth it into an even layer. Pour the cinnamon swirl mixture evenly over the batter. Scrape the remaining cake batter on top and smooth it into an even layer. Insert a knife to the batter and swirl gently. Sprinkle the cinnamon streusels toppings on top of the batter. 8. Bake the cake for 60 to 70 mins, until the cake tester inserted into the center comes out clean.